You are here: Home » These berries are not very blueberry… Swedish wild blueberries are actually bilberries! We had delicious wild blueberry compote (sylt) and homemade whipped cream, YUMMO! I just love wild blueberries, and they are totally different from American or Canadian wild blueberries, which resemble more a grape than the blueberries my hubby picks from the forests in Sweden. I am not sure why they are so different. All I know, is that when you eat the European variety, your teeth and tongue look like someone has punched you in the mouth. You’re black and blue for at least a day after eating these berries. After a search on Wikipedia, I found out that what they call wild blueberries in Canada are completely different from the ones in Sweden! 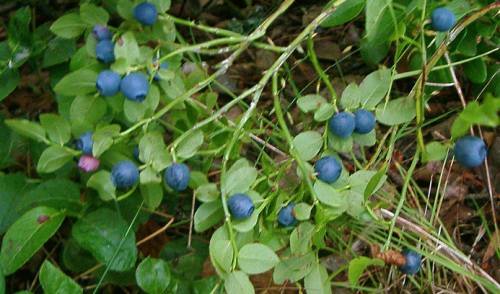 The ones in Sweden are called Bilberries, and they are difficult to cultivate, thus they are always wild-picked. AHHHHH, no wonder! Well, I am so happy that I can get bilberries here in Toronto (still called blueberries on the package). 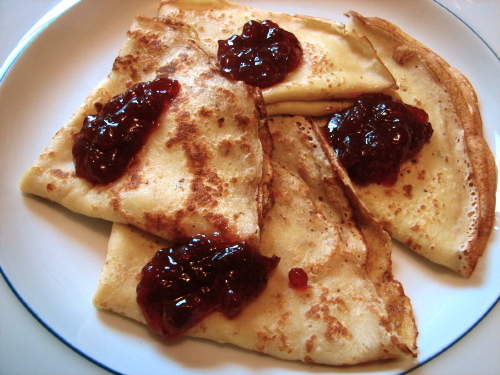 They are from Lithuania or Latvia, which have a very similar climate to Sweden since they are nearby. 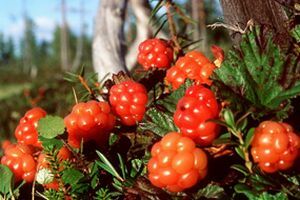 Did you know the cloudberry is called bakeapple in Canada? 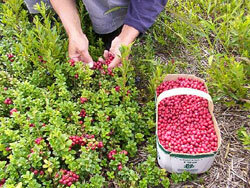 Did you also know that partridgeberry is also otherwise known as lingonberry up in the northern provinces of New Foundland? Here’s a place for you to order cloudberry and lingonberry preserves, syrups and punch concentrate online from a place in New Foundland! Also, wild European blueberry jam (bilberry jam) is widely available in Toronto under the Bonne Maman brand, Wild Blueberry Preserves. You can find it at Metro, Longo’s and other Canadian grocery stores. Oh, we have bilberries in Poland, too. And I miss them a lot. Yes, I know, those berries are so much flavorful! I found “bilberries” at Metro as Bonne Maman Wild Blueberry jam, since it is made in France. But it is much cheaper to make your own jam and buy it from Yummy’s. Have to you been to Starsky’s yet, a Polish store in Toronto? I went to Yummy Market today to look for bilberries. In the freezer section, I found bags of frozen blueberries, frozen wild blueberries, and frozen black currants. Only the latter had country of origin on them and it was Lithuania or Latvia. Could you confirm that it was the wild blueberries you purchased and not the black currants? I can’t tell the difference by looking at them as to which ones are bilberries. Good luck! 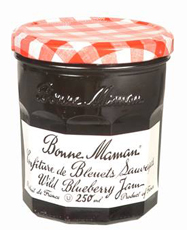 And if you’re lazy… Bonne Maman makes bilberry jam called “Wild Blueberry Preserves”, and they are available at almost all big chain grocery stores like Metro, Sobey’s and Loblaw! Swedish/European blueberries are also different in one more way. While North American blueberries are a mild laxative, the bilberry is actually “stopping” and blueberry soup is commonly used to help recover from tummy flues in Sweden. The effectiveness as a cure is a bit questioned, but it is still a good way to replenish some energy and fluids.